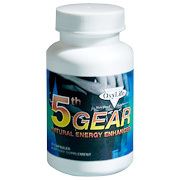 5TH GEAR is a safe, synergistic blend of natural ingredients that gives your body what it needs. They combine to produce a mental clarity and awareness that is difficult to explain. Some users describe it as a clear-headed, productive energy - like they feel when they're at their very best. Helping them to get more done while feeling great. 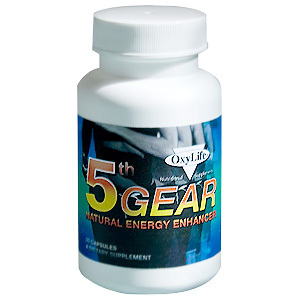 5TH GEAR was created for those who experience mild fatigue on a regular basis due to a busy lifestyle. Many, just have too much to do to let fatigue slow them down. Others enjoy the added alertness to help their creativity or mentally sharpness. Some want to increase their income by being more productive. And some just want the extra energy to exercise, spend quality time with others or simply get more enjoyment out of life. 1 capsule in the morning and another 5 hours later only if desired. Discuss with your physician if you are pregnant or nursing. Keep out of reach of children. Benefits:Natural ingredients that gives your body more energy without the side effects. Help with awareness and mentally sharpness. Increase your income by being more productive. Increase extra energy to exercise. Spend quality time with others or simply get more enjoyment out of life. 5th Gear - is shipped in a discrete, unmarked package. Orders are processed immediately and usually take about 3 to 5 working days to be received. We do ask that you try it for 2 to 3 weeks to feel the full effects. Any information received is used only for order processing and shipping purposes. Your information, such as e-mail address, will never be disclosed to a third party.